When you boost your speed in high range, you'll reduce travel time across your jobsite or between jobs. If you maintain a large campus, for example, the 2-Speed travel option helps you quickly travel to the next job site quickly to perform your next job. For long-haul jobs or work on large jobsites, 2-Speed travel increases your productivity all day long. Farmers rely on the 2-Speed travel option to load bales onto trailers in the field, shortening their travel time as they load out their bales. It can be a hassle to load and unload your machine on a trailer, and it consumes valuable time during your workday. Instead of a trailer, simply use the 2-Speed travel option to travel across a sub division or large commercial jobsite and tackle your next task faster. On many models, maintenance is simplified with two oil plugs positioned on the outside of the sprocket. This design allows for easier oil draining and filling. Using a loader requires you to move between multiple functions: digging, lifting, and traveling. Often, you need power for these functions at the same time. Performance should be measured by how well each of these components work together. We call it machine balance. We engineer every loader to perform with each component efficiently working together. However, not every manufacturer designs machines in the same way. Kubota, Caterpillar, Case and New Holland might perform one function well, but they struggle when it comes to components working together. Faster travel speed equals more productivity. That’s because when you’re traveling across your jobsite or between work areas, you’re not working. And if your loader travels slowly, loss of productivity can really add up. 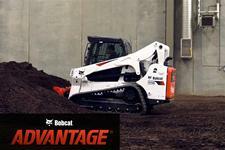 That’s why we engineer Bobcat loaders for faster travel speeds. Unfortunately, not all loader brands make travel speed a priority. Kubota, Caterpillar, Case, and New Holland, say they have similar travel speeds, but each machine performed differently in our travel speed test.